It may or not have been the intention to seal a legacy, but Lucinda Williams has accomplished this feat over the last eighteen months. For a long time 1998’s CAR WHEEL ON A GRAVEL ROAD was considered her seminal album and may well be the case when the book is closed. However back to back double albums since the end of 2014 have pushed this release to the absolute limit. First up, DOWN WHERE THE SPIRIT MEETS THE BONE made many a critic gasp with its imposing magnificence, and if anything THE GHOSTS OF HIGHWAY 20 has taken another step up the ladder of serial acclaim. Once again a double disc set has emerged and don’t let the combined fourteen tracks think the record has been spread out as the running time is in the vicinity of an hour and a half. What you get is a heavyweight production featuring song writing at its unabated best, a double pronged guitar soundtrack epitomised by its optimum accuracy and an alluring songstress soaking in the solace of southern soil. Lucinda has returned home for this record and used the concrete sparseness of an Interstate running through her beloved Louisiana to be the spine for over a dozen songs spilling from its vicinity. In contrast to the mundanity of a road barely taking notice of its surroundings, each composition has an inner beauty, often harsh and dark in its sentiment, but ultimately rewarding the listener for their endeavours. This endeavour should be armed with a lyric sheet and the notion that no Lucinda Williams album is going to reveal its greatness on a solitary listen. To achieve the first objective of the album holy trinity, Lucinda digs merely into her gravelly vocal repertoire to extol all the aching, pain, anguish, fear and hope that exists in her songs. Secondly pouring over the lyrics reveals an admired structure, frequently using repetition while ensuring a clear path for either understanding Lucinda’s intentions or creating a canvas for you to effectively surmise. Both these qualities are brought together by the guitar skills of Bill Frisell and Greg Leisz, creating a backdrop to savour, equally adept at filling the interludes as well as standing back to allow the vocals to prosper. The writing of this album came at a time of great grief for Lucinda and her co-producer husband Tom Overby, with both losing their fathers. Each late relative gets their own tribute song and in contrasting efforts. On one of two non- original songs selected for this album, a version of Springsteen’s ‘Factory’ lifted from his 1978 record DARKNESS ON THE EDGE OF TOWN, was used as an ode to Calvin Overby. Lucinda dug deep into her song writing well to pen a tribute for her father, the poet Miller Williams, and ‘If There’s a Heaven’ is a spiritually moving effort, etched in emotion and defies the listener not to develop the origins of a small tear. Before attempting to share some thoughts on the other originals, it is worth mentioning the second song not formed of Lucinda’s lyrics. ‘House of Earth’ uses the words of Woody Guthrie and further investigation reveals this is a novel he wrote alongside the many hundreds of songs. Lucinda obviously is credited with the music and it is fitting that a great contemporary songwriter has saluted a visionary. The remaining eleven tracks reveal a pick and mix selection for listeners to hone in on their successful traits. For me ‘Louisiana Story’ leaps to the head of the queue and is quite simply Lucinda at her nostalgic best, with this time her mother taking centre stage. At over nine minutes long, it’s a meaty effort and forms a near symmetrical structure of the final track on each disc being quite lengthy with its alternative on the other side being the twelve minute ‘Faith and Grace’. This suggests a touch of stamina being required, but then grasping the music of Lucinda Williams is no mere throwaway task. With the word ‘ghosts’ in the title, there is little surprise that many of the songs hover around either the end of life or post life theme. Therefore prepare yourself for a bit of morbidity and the personification of death in the splendidly stark titled ‘Death Came’. This is preceded by the superb ‘Doors of Heaven’ where Lucinda splits the excellent guitar pieces by announcing ‘open up the doors of heaven and let me in’. 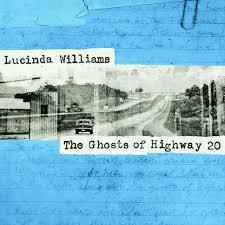 The after-life is also reflected in the title track ‘Ghosts of Highway 20’ which is the only original where Lucinda shares the writing credits with Tom. Opening disc two, it sets the scene of all the stories that are littered either side of the Interstate. One such character is revealed in ‘I Know All About It’, another mine of intense lyrical observation before Lucinda fades out with profound repetition to drive home the message. Positivity in the guise of forgiveness can be detected in ‘Place in My Heart’, while the sentiment of ‘Bitter Memory’ is to consign it to history or once again repeatedly at the conclusion ‘let me show you to the door bitter memory’. ‘Can’t Close the Door on Love’ is another song clinging onto the positives among a sea of adversity and leaves the listener room to at least wonder about its inspiration. Food for thought also exists in ‘If My Love Could Kill' and like so many of the tunes on the record, the sound vibes have a consistent appeal. The final track for comment is disc one opener ‘Dust’ and is the catalyst for Lucinda to use the writing technique of repetition with ‘you couldn’t cry if you wanted to’ and ‘even your thoughts are dust’ ensuring the sentiments of the songs linger long after its conclusion. THE GHOSTS OF HIGHWAY 20 is a road album with a difference and presents a gut wrenching passionate artist sharing their unrelenting craft. 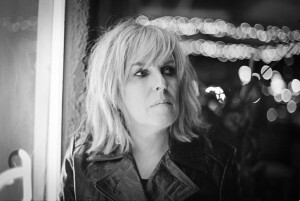 It possesses so many avenues, themes and inspirations to explore that the ritualistic activity of understanding a Lucinda Williams album is an enlightening experience. Lucinda continues her extraordinary mode of creative song writing ensuring no half measures are served. Ultimately this album conquers morbidity and if that age old rhetoric of defining ‘Americana’ surfaces again then look no further than a record which will move those prepared to tune into the wavelength of Lucinda Williams.